Firefighters are employed in a civil occupation in which they are exposed to variable and unpredictable working conditions (e.g. : night shift schedules, sudden and unpredictable work patterns, strenuous physical work) and environmental stressors (e.g. : extreme temperatures, smoke) where they are required to safely assess hazards in a dynamic operating enviroments. Emergency tasks are further complicated by high-intensity activity over an unpredictable work durations [1-6]. These environmental, physical and emotional stressors encountered by firefighters are likely the key determinants of job-related injuries and fatal events at work [7-10]. A recent study of Britton et al. reported that during the 5-year period, the slips/trips/falls (34%) and equipment/ tools/machinery (31%) were the most common mechanisms with the lower extremity, the most common body part involved (35%). In order to stay safe, and to successfully complete their work, firefighters must constantly assess and process large numbers of sensory stimuli (i.e., people in need, fire conditions and behaviour, environmental events, movements of colleagues) and adapt quickly to the inherent hazards present in the dynamic working environment, often in a dynamic manner. To quickly establish and adapt to these risks, firefighters must react quickly in their dynamic working environment . Reaction time (RT) is a measure of processing speed and reflects response efficiency in information processing tasks and is considered a lower-level cognitive function that supports basic information processing . Previous studies [14, 15] showed that RT can be defined by three distinct processes: 1) perception time (time for the application and perception of the stimulus and giving the necessary reaction to it); 2) decision time (time for giving an appropriate response to the stimulus); 3) motor time (time for compliance to the order received). In contrast, higher-level cognitive functions are often called executive functions and are important in tasks that demand concentration, coordination, change and control of instinct . Both lower and higher level cognitive functions are needed to safely evaluate the dynamic risks present in an emergency. Currently, little information is available regarding the cognitive functions (e.g., attention and response time) in fire and rescue service workers. Therefore, the main goals of the present preliminary study were to analyse the RT responses of Italian Firefighters and to compare their cognitive responses with non-firefighting healthy trained subjects. Sixteen healthy male volunteers (Age: 40.3 ± 6.7 years; Weight: 84.9 ± 8.9 kg; Height: 178 ± 6 cm; BMI: 23.8 ± 2.3 kg/m2) were recruited and divided into 2 groups, each formed by 8 subjects: Firefighters (FG) and Control (CG). A sports medicine accredited doctor examined each subject before the beginning of the study based on the following inclusion criteria: regular physical fitness activities (for at least 2 years), aged between 30 and 55 years and without clinical problems as testified by medical certificate. Exclusion criteria were: current medication intake, movement limitations or injury, history of upper limb injuries and smoking habit. All participants completed the AAHPERD exercise/medical history questionnaire prior to assessment in order to ascertain activity level, educational background, dietary habits, tobacco smoking and alcohol consumption, medication and history of physical activity. None of the participants underwent any strenuous activity and training outside their normal training schedule 48 hrs prior to presenting for testing. The local Institutional Review Board approved the study designed to analyse the RT of Italian Firefighters and to compare their results with healthy trained volunteers. Anthropometric (i.e., body weight, height and Body Mass Index) and RT evaluations were administered during a single experimental session (one day) at approximately the same time of the day (10.00 am; ± 1 hr). RT tasks were assessed in the same sequence separated by 3 min of rest All assessments were carried out in a gym with controlled ambient conditions (temperature: 22-24°C; humidity: 50-60%), and without noise or other distractions. Subjects were instructed to avoid food and drink (i.e coffeè) in the hour before testing and to avoid strenuous exercise 48 hours before each trial. All participants were adequately informed about the study and gave their written informed consent. Researchers were present to explain and resolve any doubt regarding the research project. 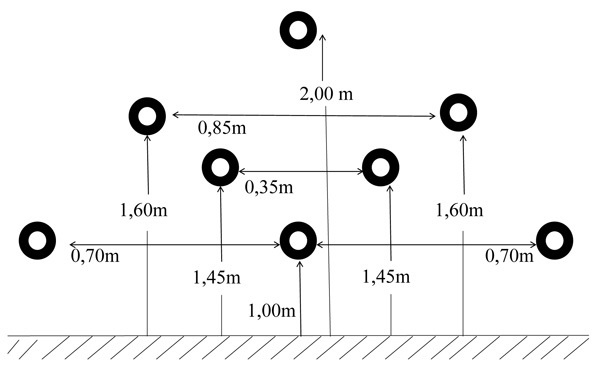 Weight (cm) and height (kg) were measured with participants wearing light clothes and barefoot using an electronic scale (± 0.1 kg) and a fixed stadiometer (± 0.1 cm) (Seca 702, Seca GmbH & Co. KG, Hamburg, Germany). The Body Mass Index (BMI) assesses the weight relative to height and it was calculated dividing the body mass by height in square meters (kg/m2). 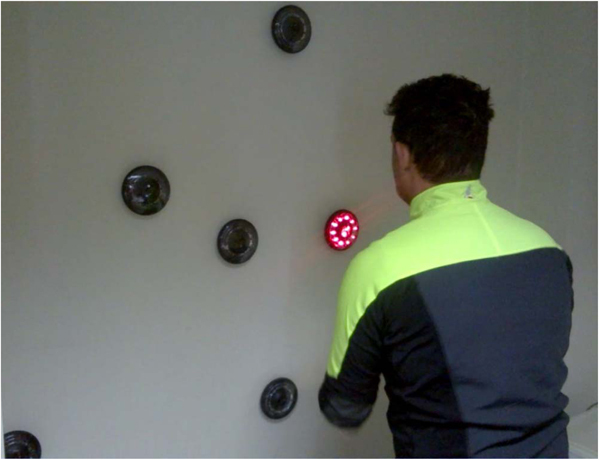 Accuracy and RT to visual stimulus were assessed using the Fitlight Trainer® (FitLight Sports Corp, Ontario, Canada), a wireless reaction system comprised of eight LED lights controlled by a tablet computer. The lights have an inbuilt sensor which reacts to proximity or touch and deactivates the light. In order to take the test, participants were asked to respond, tapping the light, as quickly as possible to the red light that appeared on the disc in a random order (Fig. 1). Fig. (1). Fitlight Trainer® and position of subjects. Light positioning was present in Fig. (2) and eight lights were used as stimulus. Each subject was positioned at a distance of 30 cm from the wall, centered to the pattern, joined feet, standing upright with arms along the hips. After the presentation of each stimulus, the subject returned to the same position (with arms along the body) waiting for the next signal. T1 = 1 second of stimulus duration and 1 second interval between stimulus and the other. T2 = 0.5 seconds of stimulus duration and 1 second interval between stimulus and the other. T3 = 0.5 seconds of stimulus duration and 0.5 second interval between stimulus and the other. Performance on the test was evaluated by total Time-To-Completion (TTC), Mean of Reaction Time (MRT), and errors made (subject was not quick to touch the disc activated; E). Fig. (2). Fitlight Trainer® positioning. Data analysis was completed using IBM SPSS (ver.23) software for Windows. Data are reported as means and standard deviations, and significance was set at p ≤ 0.05. Normal distribution of data was assessed by the Shapiro-Wilk test. Considering that Shapiro-Wilk test rejected the null hypothesis (p ≤ 0.05), and concluded with 95% confidence that the data was not normally distributed, Mann Whitney U test between groups was applied to asses differences in TTC, MRT, and E. The Friedmann test and Dunn-Sidak post hoc test were used to evaluate significant differences in the 3 conditions (T1,T2 and T3) in each variable (TTC, MRT, and E) of each group (CG and FG). No significant differences based on the anthropometric (age, weight, height and BMI) parameters were observed between groups Table 1. Table 1. Mean ± Standard Deviation (SD) of anthropometics characteristic of the partecipants. Performance values (Means ± SD) of TTC, MRT, and E values between groups are shown in Table 2). Only E showed statistical differences (p <0.05) between groups with higher values in FG (+177%) compared to CG. Significant differences emerged on the 3rd condition (T1,T2 and T3) in each variable (TTC, MRT, and E) of each group (FG and CG) Table 3). Despite TTC and MRT values decreased from T1 to T3 in both groups, E value decreased in T2 (FG= -76%; CG= -33%) but increased in T3 (FG= 3137%; CG= -876%) compared to T1. Table 2. Mean ± Standard Deviation (SD) of Time-To-Completion (TTC), Mean of Reaction Time (MRT), and errors made (E). Table 3. Statistical differences on the 3 condition (T1,T2 and T3) in Time-To-Completion (TTC), Mean of Reaction Time (TRM), and errors made (E) of each group. Firefighting involves a very complex set of tasks performed in a potentially hostile environment that can affect health and safety of workers. Considering that to evaluate responses in a live-fire scenario is complicated; the present study sought to analyse the cognitive responses to a visual stimulus of Italian Firefighters in an easy manner. To our knowledge, this is the first attempt done in scientific literature. The main findings of the present study are that FG made significantly more errors than CG where the reaction to stimulus required (0.5 s of stimulus duration and 0.5 s interval between stimuli), and it was high (Trial 3) highlighting at lower levels of cognitive function. Previous studies [17, 18] described RT as 1) Simple RT (one stimulus and one response), 2) Recognition RT (stimulus that should be responded to and others that should not get a response), and 3) Choice RT (multiple stimulus and multiple responses). Solanki et al. highlighted that RT is a valid indicator of rate of processing of sensory stimuli by the central nervous system and its execution in the form of motor response. In this study, RT performance was measured using the Fitlight Trainer®, a commercially available wireless reaction system comprised of LED lights used as targets for users to activate or deactivate, that is fast and simple to use in different place (field and/or indoor) on every surface (floor and/or wall). It is used in many different sports to train basic physical skills, such as speed and agility in addition to RT. No modifications were made to the system. The setup of the lights and the programming of the light sequences were original. In sport science literature, the RT values of volleyball , basketball , and soccer  were significantly greater when athletes were compared to control subjects. Both the FG and CG group demonstrated differences in the 3 condition (T1, T2 and T3) of Time-To-Completion (TTC), Mean of Reaction Time (MRT), and Errors made (E), and significant differences in visual RT between them. However, in our study, it was surprising that the CG showed significantly fewer errors (n=4) than the FG (n =12) in high-intensity task (T3). It is likely that, despite a relative advantage conferred as a result of training, that performance in the open-field environments of sport is potentially altered by training, rather than by ability alone. Thus, given the lack of significant differences in RT between firefighters and the general population, we hypothesize that this “static” and “non-functional” test (in front of the wall) was not likely to significantly reflect the “dynamic” and highly variable working conditions where firefighters generally operate (i.e. temperature, smoke, noise, visibility, time urgency and the knowledge that civilians are in imminent danger) thus negating any potential advantage previously observed in this population. During the emergency, activity firefighters regularly assess multiple stimuli and it is likely that the present study did not sufficiently reflect the normal working conditions. Regardless of this, the ability to maintain attention, to store important details (e.g. escape routes from a structure), and to rapidly and effectively make critical decisions are an important cognitive component for firefighters as reduction in RT could result in injury and ineffective and unsafe task performance if the firefighter is unable to respond to a rapidly degrading environment. We recommend that a more thorough investigation of more ecologically valid firefighting RT tasks be undertaken in the future to validate our hypothesis. Robinson et al. have noted that the impairment of cognitive function can increase the risk of injury and death. To further reinforce this position, Morley et al. tested whether cognitive function changed after treadmill exercise in thermal protective clothing.The results showed that neurocognitive test scores did not change immediately after exercise but a memory test was reduced 60 and 120 min after exercise with the mean of the 10 slowest reaction times increased in the 120 min after exercise. The authors suggest a need for additional rest and recovery after stress activity. Various studies [3, 12, 24-27] have previously reported similar impairments in cognitive function after performing simulated firefighting without exposure to smoke, and reported impairments in cognitive function. Robinson et al. discovered that simulated firefighting emergency can exacerbate cognitive impairments, which justify maladaptive responses observed during fire suppression. Kivimäki and Lusa , assessed the relationship between stress reaction and cognitive function during a simulated smoke-diving task in a poorly lit, unfamiliar site. The results showed that as the stress response increased during simulated smoke-diving, cognitive function concurrently declined. However, in contrast to these studies, previous research using experienced firefighters indicated some positive changes in visual attention following work in the heat despite no meaningful changes in processing speed or working memory . It is likely that despite elevated core temperatures and fatigue levels, the relative experience of the firefighters studied by Walker et al. may have provided a protective mechanism against cognitive decline in the heat. Understandably, our study was subjected to a number of limitations. First, the tests with Fitlights Trainer® do not represent the real firefighting situation (people in need, environmental events, movements of colleagues). Second, the population was not very large. Third, it was not verified whether changing the order of the various trial test modifies results. Fourth, this study did not evaluate job performance in relation to fatigue. Regardless of these limitations, it is not possible to make a criterion validation by comparison of the test with respect to an established test, because there is no “gold standard” for the evaluation of reaction time in firefighters. Future research including a larger sample size and simulated firefighter activities is recommended to ascertain the effect of cognitive training protocol on job performance. Based on our findings, neurocognitive training in firefighters is likely a worthwhile training protocol, given the apparent lack of links between RT and firefighter training in simple tasks. Regardless, further investigation of the causal links between training and higher order cognitive should be undertaken into the future. Considering that firefighters should have a high level of decision-making capabilities, these results may also represent the basis for strength and conditioning trainers to develop appropriate conditioning programmes aimed at improving the cognitive responses of a firefighter. In fact, the relationship among injuries, environments, physiological strain and the cognitive function impairment suggests to develop methods for keeping firefighters’ cognitive function below critical levels during work. Furthermore, a periodic evaluation of cognitive function could be necessary to ensure capable and immediate responses by personnel who perform important public safety occupation. Firefighters are often required to perform demanding cognitive and physical tasks simultaneously. High levels of cognitive capabilities are generally important for all firefighters activities that require complex and rapid decision-making. For this reason, the administration of this type of training should be constantly and adequately proposed in Firefighters to increase their job performance. Currently, it is unclear whether cognitive training programs are a part of the regular training of firefighters. Furthermore, it is likely that where cognitive training is undertaken, most of all do not take into account operational requirements, and thus may not optimally instill the combined skills that are required to perform their jobs efficiently and effectively. We believe that the work presented in this study provides a solid base to reach the goal of developing exercises that will improve occupational job performance and the day-to-day readiness of firefighters. To address this issue, we should start research and to develop a program that seeks to create and validate specific exercises, and workout programs that integrate cognitive training with job performance. The local institutional review board approval this study. Written informed consent were obtained from all participants. Beaton R, Murphy S, Johnson C, Pike K, Corneil W. Exposure to duty-related incident stressors in urban firefighters and paramedics. J Trauma Stress 1998; 11(4): 821-8. Bos J, Mol E, Visser B, Frings-Dresen M. The physical demands upon (Dutch) fire-fighters in relation to the maximum acceptable energetic workload. Ergonomics 2004; 47(4): 446-60. Greenlee TA, Horn G, Smith DL, Fahey G, Goldstein E, Petruzzello SJ. The influence of short-term firefighting activity on information processing performance. Ergonomics 2014; 57(5): 764-73. Plat MJ, Frings-Dresen MH, Sluiter JK. Impact of chronic diseases on work ability in ageing firefighters. J Occup Health 2012; 54(2): 158-63. Schermer TR, Malbon W, Adams R, Morgan M, Smith M, Crockett AJ. Change in lung function over time in male metropolitan firefighters and general population controls: A 3-year follow-up study. J Occup Health 2013; 55(4): 267-75. Wolkow A, Aisbett B, Reynolds J, Ferguson SA, Main LC. The impact of sleep restriction while performing simulated physical firefighting work on cortisol and heart rate responses. Int Arch Occup Environ Health 2016; 89(3): 461-75. Gledhill N, Jamnik VK. Characterization of the physical demands of firefighting. Can J Sport Sci 1992; 17(3): 207-13. Kales SN, Soteriades ES, Christophi CA, Christiani DC. Emergency duties and deaths from heart disease among firefighters in the United States. N Engl J Med 2007; 356(12): 1207-15. Perroni F, Cortis C, Minganti C, Cignitti L, Capranica L. Maximal oxygen uptake of Italian firefighters: Laboratory vs. field evaluations. Sport Sci Health 2013; 9: 31-5. Perroni F, Guidetti L, Cignitti L, Baldari C. Psychophysiological Responses of Firefighters to Emergencies: A Review. The Open Sports Sci J 2014; 7(Suppl-1, M3): 8-15. Britton C, Lynch CF, Ramirez M, Torner J, Buresh C, Peek-Asa C. Epidemiology of injuries to wildland firefighters. Am J Emerg Med 2013; 31(2): 339-45. Smith DL, Petruzzello SJ. Selected physiological and psychological responses to live-fire drills in different configurations of firefighting gear. Ergonomics 1998; 41(8): 1141-54. Wetherell A. Cognitive and psychomotor performance tests and experiment design in multiple chemical sensitivity. Environ Health Perspect 1997; 105(Suppl. 2): 495-503. Teichner WH. Recent studies of simple reaction time. Psychol Bull 1954; 51(2:1): 128-49. Tripo RS. How fast can you react? Sci Dig 1965; 57: 50. Diamond A. The early development of executive functions Lifespan cognition: Mechanisms of change 2006; 70-95. Luce RD. Response times: their role in inferring elementary mental organization Oxford Psychology series 8 1986; 562. Welford AT. Choice reaction time: Basic concepts Reaction times 1980; 73-128. Solanki J, Joshi N, Shah C, Mehta HB, Gokhle PA. Study of Correlation between Auditory and Visual Reaction Time in Healthy Adults. Int J Med Pub health 2012; 2: 36-8. Hasçelik Z, Basgöze O, Türker K, Narman S, Özker R. The effects of physical training on physical fitness tests and auditory and visual reaction times of volleyball players. J Sports Med Phys Fitness 1989; 29(3): 234-9. Ghuntla TP, Mehta HB, Gokhale PA, Shah CJ. A Comparative study of visual reaction time in basketball players and healthy controls. NJIRM 2012; 3: 49-51. Comparison of sprint and reaction times of professional and amateur football players. I Gazi Physical Education and Sport Sciences Congress 2000; In: Sim Publishing; Ankara. Turkey. 2000; pp. 101-8. Robinson SJ, Leach J, Owen-Lynch PJ, Sünram-Lea SI. Stress reactivity and cognitive performance in a simulated firefighting emergency. Aviat Space Environ Med 2013; 84(6): 592-9. Morley J, Beauchamp G, Suyama J, et al. Cognitive function following treadmill exercise in thermal protective clothing. Eur J Appl Physiol 2012; 112(5): 1733-40. Lee JK, Koh AC, Koh SX, Liu GJ, Nio AQ, Fan PW. Neck cooling and cognitive performance following exercise-induced hyperthermia. Eur J Appl Physiol 2014; 114(2): 375-84. Zhang Y, Balilionis G, Casaru C, et al. Effects of caffeine and menthol on cognition and mood during simulated firefighting in the heat. Appl Ergon 2014; 45(3): 510-4. Hemmatjo R, Motamedzade M, Aliabadi M, Kalatpour O, Farhadian M. The effect of artificial smoke compound on physiological responses, cognitive functions and work performance during firefighting activities in a smoke-diving room: An intervention study. Int J Occup Saf Ergon 2017; 2017(28): 1-8. Kivimäki M, Lusa S. Stress and cognitive performance of fire fighters during smoke-diving. Stress Med 1994; 10: 63-8. Walker A, Argus C, Driller M, Rattray B. Repeat work bouts increase thermal strain for Australian firefighters working in the heat. Int J Occup Environ Health 2015; 21(4): 285-93.